This post may contain affiliate links. Please see our full Disclosure Policy for details. 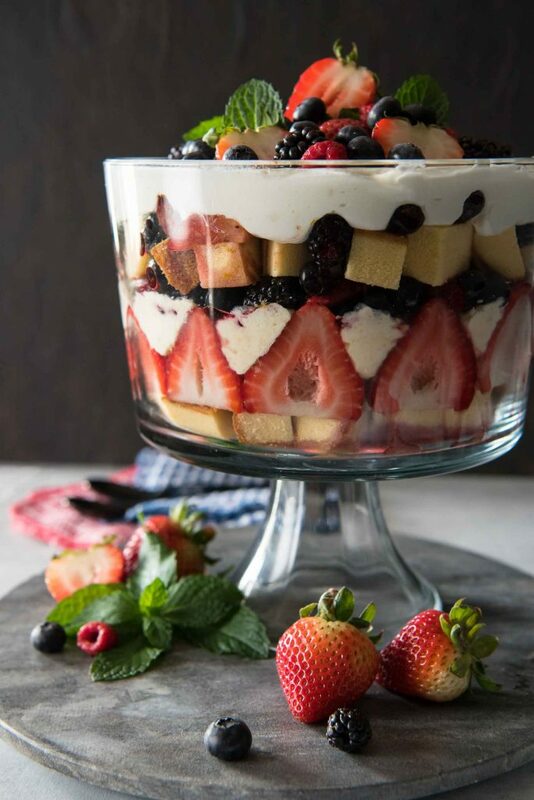 This Chantilly Berry Trifle is a real crowd pleaser! 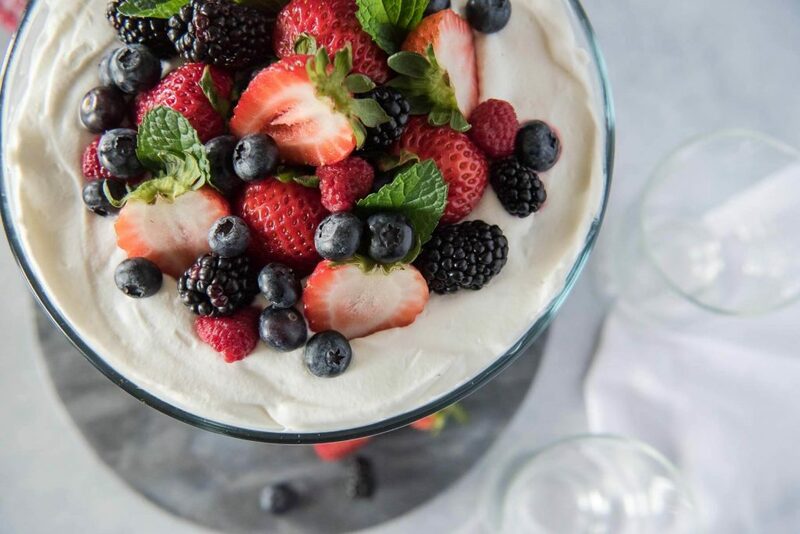 Pound cake, cheesecake filling, whipped cream, and berries marinated in raspberry liqueur make up the layers of this dessert, which is almost too pretty to eat! 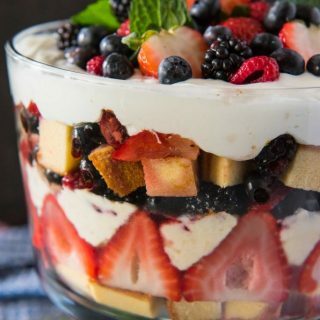 This Chantilly Berry Trifle is pure magnificence. In that it’s magnificently easy and quick to make. Which is good because – hello – today is Mother’s Day, and I bet some of you forgot. You’ve got two options: (1) you could run to the store and buy flowers and candy and a lame card that will get lost in the bottom of the mail pile. OR (2) you could run to the store, grab the ingredients for this dessert, and make it instead. Which I promise will probably be closer to what the Moms, Aunts, Grandmas, and Wives in your lives want anyway. She’ll mostly be impressed at the effort you put into it. Remember those handmade things you gave her as a kid? They may have been pure garbage, but you made them, so they were perfect. I just love berry season. Everything about produce is just so damn photogenic, but berries have a certain sort of joie de vivre that makes them just that much cheerier and lovely to look at. Can inanimate objects have joie de vivre? My to-do list of blog recipes grows by the day. I feel like I never have enough time to put a dent in it, but this is one of those recipes I finally got to check off! 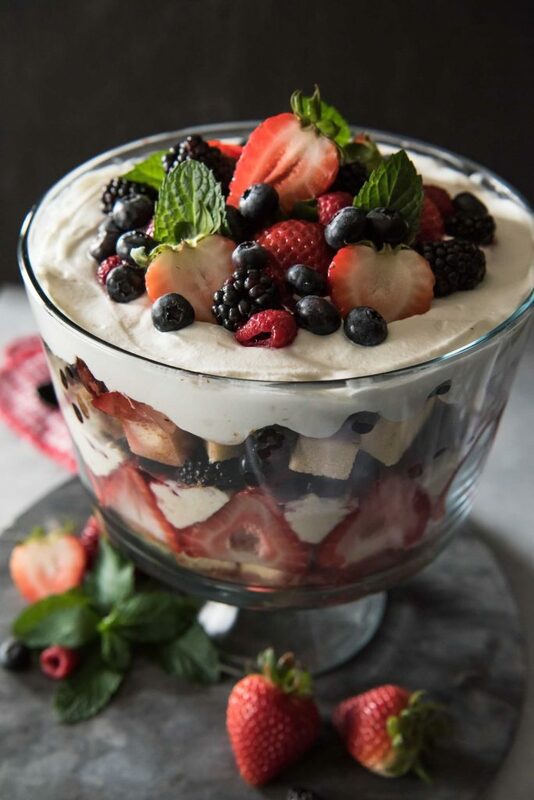 I snagged a trifle bowl off Amazon (<– affiliate link!) months ago, and it’s just been sitting on my counter, begging to be filled with delicious creams and cakes and fruits. It’s been penciled in for service more than once, but the follow through just wasn’t there. So sorry, trifle bowl. Today is your time to shine. Getting back to how magnificently easy this thing is. First of all, it’s no-bake, which is always a yes in my book. Unless, of course, you want to use homemade pound cake. In which case, good on ya, but I’m gonna stick to the good old frozen food aisle version. I will, however, make my own cheesecake filling and whipped cream because I’m snotty like that. All in all, this recipe will take you about 30 minutes to throw together – if you don’t have squirrel syndrome like I do and try to do 37 things at once and constantly walk away even though the impending thunderstorm outside is threatening to steal all your perfect early afternoon photography light. Combine berries, liqueur, and orange zest in a large bowl, Toss to coat, then let sit for at least 15 minutes. 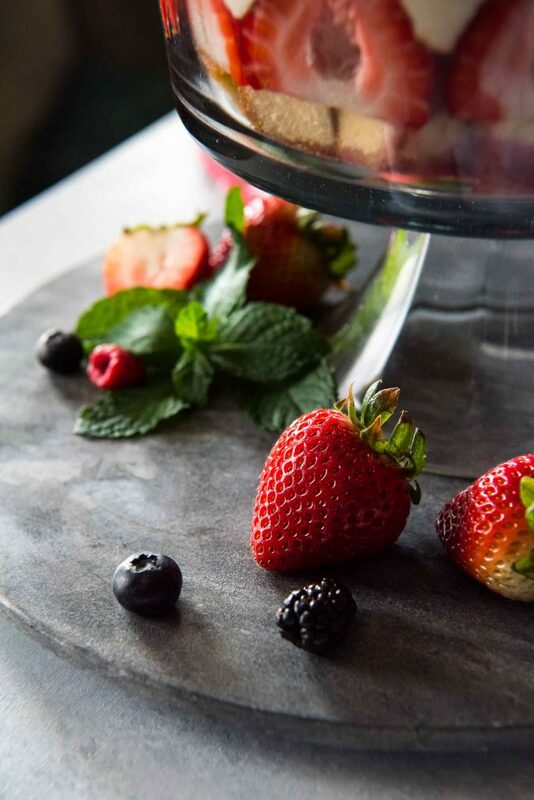 While berries marinate, make cheesecake pudding. Using a hand mixer, blend ½ cup of milk with the cream cheese until it is completely smooth. Add the pudding mix and the remaining milk to the cream cheese mixture. Beat for about a minute until thoroughly mixed. Set aside. Place heavy cream, powdered sugar, and almond extract in a cold bowl and whip to medium peaks. Refrigerate until ready to use. Place half the cake cubes in the bottom of the trifle bowl. Line halved strawberries around the edge of the bowl, cut side out. 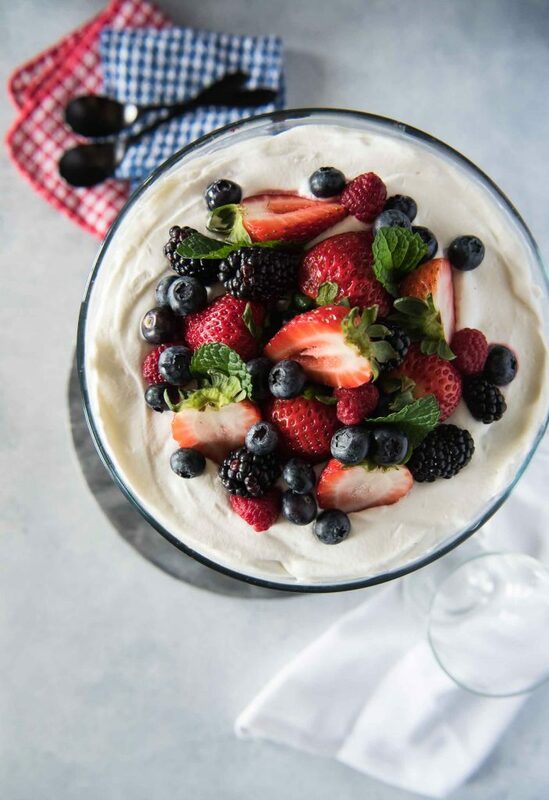 Fill the cavity with the cheesecake filling, then place half of the marinated berries on top. Add the rest of the cake cubes, then the remaining berries and juice. 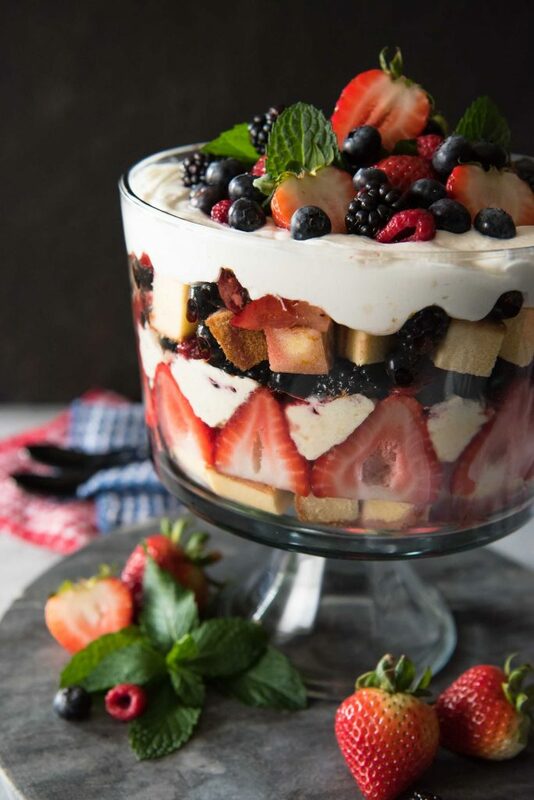 Pipe or spread the cold whipped cream on top of the trifle, then decorate with assorted fresh berries and mint leaves, if desired. Refrigerate for at least 1 hour before serving. Did You Make This Recipe?Mention @CrumbyKitchen or tag #crumbykitchen for some Instagram love! What does your Mom love? Find something new to surprise her with from one of these delicious recipes from my fellow Sunday Supper Tastemakers! Japanese Chicken Curry by What Smells So Good? Hi Erica, I’ve always wanted to make a trifle too but something always comes up. I bet the raspberry liquor is delicious with the berries. Gorgeous dessert. Such and beautiful and delicious dessert! 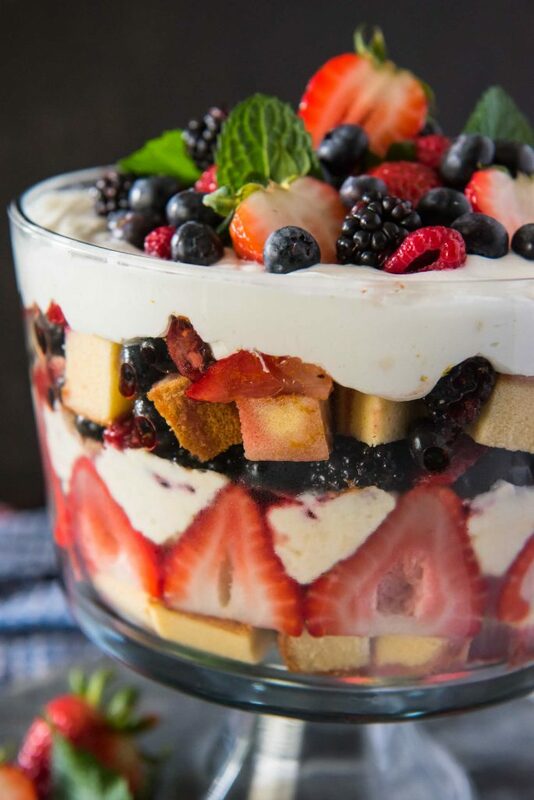 I made a trifle last week for my book club….and now I want to make another! Yours is picture perfect!!! Tons of fruit – perfect for the spring and summer, especially here! I love making trifles. Yours looks so pretty.